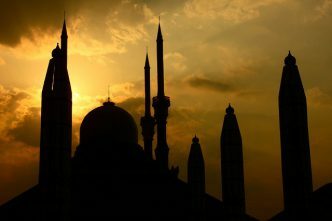 With opposition parties threatening to play the Islamic card on a broader scale, the appointment of National Intelligence Agency (BIN) director Budi Gunawan to a leading position on the Indonesian Mosque Council raises interesting questions ahead of President Joko Widodo’s bid for re-election next year. The president has also named former armed forces commander General Moeldoko as his new chief of staff. That strengthens his circle of police and military loyalists as he prepares for what is likely to be a testing campaign season. Vice-president Jusuf Kalla remains chairman of the Mosque Council, which oversees the country’s 800,000 mosques, many of them potential gathering points to rally support against Widodo when campaigning begins in earnest in August. Legislative and presidential elections will be held together for the first time in April 2019, but the presidential race will get the most attention, with Widodo again expected to be in a two-way fight with opposition leader Prabowo Subianto. Simultaneous elections mean that most of the horsetrading that normally drags on after a presidential election will have to be finalised beforehand, which is seen as advantageous to the president’s ruling Indonesian Democratic Party for Struggle (PDI-P). Gunawan’s first loyalty is to Megawati Sukarnoputri, PDI-P’s chairperson and a former president with whom Gunawan has had a close personal relationship going back to when he served as her adjutant. But he also spends much of his time at the palace briefing Widodo on domestic political developments. Megawati has been prodding Widodo to choose either the ambitious Gunawan or her daughter, the human development coordinating minister Puan Maharani, as his running mate in 2019. However, most analysts say they would add little value to the ticket. Widodo has never held a leading position in PDI-P. Just how hard Megawati pushes to get her way could determine whether he makes the difficult decision to jump to the second-placed Golkar Party, which has already declared its support for his candidacy. The president recently used his considerable influence to engineer the election of industry minister Airlangga Hartarto, son of a Suharto-era technocrat, to the chairmanship of Golkar—the first new face to assume the party’s leadership since the democratic era began in 1998. Widodo has a healthy lead over Prabowo in almost every poll so far. But, recalling how his rival made up ground in 2014, analysts note a troubling gap between Widodo’s popularity as a common-man leader and his electability. The president is reportedly looking for a prominent Muslim figure as a running mate to counter Prabowo, who’s expected to use the same religion-based tactics that helped bring down ethnic-Chinese Jakarta governor Purnama Busaki last year. Prabowo, a retired general, is particularly critical of Widodo for cosying up to China and its cashed-up companies to secure funding for his potentially election-winning infrastructure program, telling friends he fears China will ‘swallow Indonesia and spit it out as a client state’. 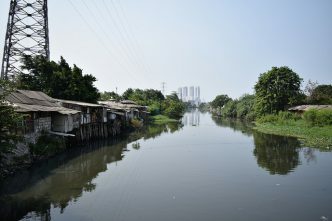 Even with the help of the Sharia-based Justice and Prosperity Party (PKS), Prabowo may find it difficult to mount the sort of campaign used against Basuki at a national level now that the conservative coalition has split over his choice of candidates for June’s provincial and district elections. Analysts believe that by joining the Mosque Council, Gunawan is seeking to burnish his Muslim credentials. But fellow panel member Azyumardi Azra, a leading Muslim intellectual, says it’ll take more than that to get Gunawan noticed as a political figure. ‘Budi Gunawan is trying to be greener, but fundamentally speaking that doesn’t mean he has Islamic credentials or will be regarded by Nahdlatul Ulama and Muhammadiyah (Indonesia’s two mass Muslim organisations) as a santri (devout) Muslim’, he says. Azra questions how useful being on the loosely structured council will be when BIN already has ‘layers’ of intelligence agents and informants monitoring mosques that are considered problematic for hate-speech or other extremist activity. Meanwhile, naming Moeldoko as his chief of staff leaves Widodo with a trusted inner circle that includes new military commander Air Chief Marshal Hadi Tjahjanto, police chief General Tito Karnavian, defence minister Ryamizard Ryacudu and political adviser Luhut Panjaitan, an ex-special forces general who’s serving as maritime coordinating minister. 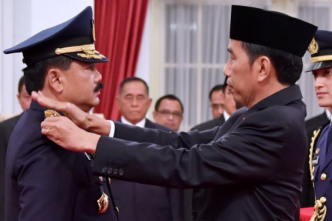 Agung Gumelar, a retired special forces general and former transportation minister, has just joined Suharto-era army chief General Subagyo Hadi Siswoyo on the president’s nine-man advisory council. Moeldoko replaces mild-mannered anti-corruption activist Teten Masduki, who is a personal friend of Jokowi but doesn’t have the hard edge the president needs from his day-to-day manager and gatekeeper as the election season approaches. A member of the People’s Conscience Party (Hanura), Moeldoko was an adjutant to intelligence guru Abdullah Hendropriyono, another long-time Megawati ally. Hendropriyono’s son, Diaz, is part of Widodo’s special staff. 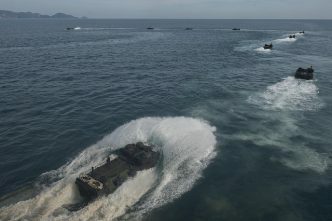 His son-in-law, former presidential security chief Lieutenant General Andika Perkasa, was recently promoted to head the military’s training command, which puts him in line for the top army post in early 2019. Wiranto, a retired armed forces chief himself and now leader of the People’s Conscience Party, has been allied with the president since the outset, initially to put a dent in the ambitions of Prabowo, with whom he’d engaged in a bitter power struggle in the aftermath of Suharto’s downfall in mid-1998. 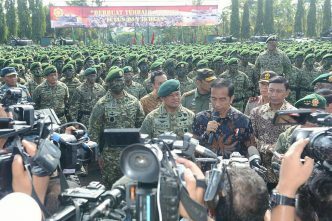 Surrounding himself with uniformed loyalists does mean Widodo is returning to a different era, but it will give the opposition pause over just how far it can go in trying to deny the president a second term. John McBeth is a Jakarta-based correspondent. Image courtesy of Flickr user Global Media Sharing.